As widely regarded as Karl Marx's Communist Manifesto is, it can be easy to forget that the scathing, seminal critique of capitalism and the bourgeoisie was hurriedly written over the course of a few days after months of procrastination. 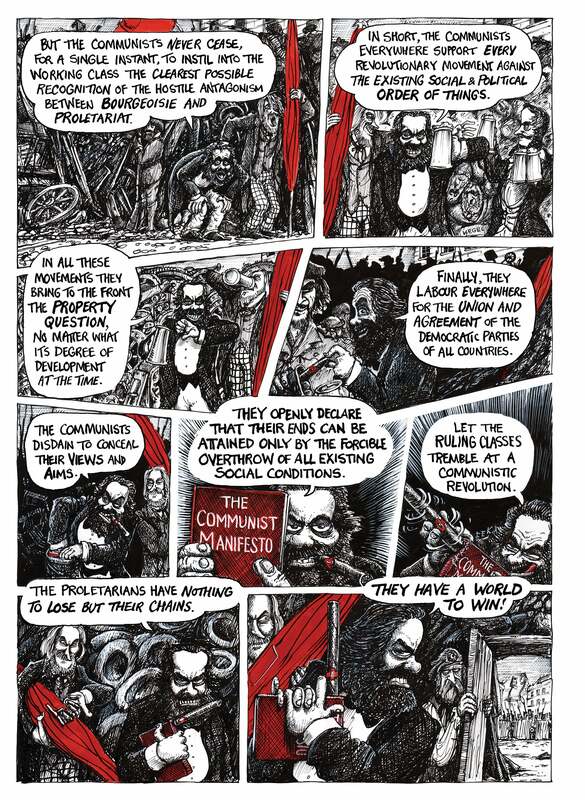 Turning Karl Marx's landmark work into a graphic novel might seem like an odd idea, but Martin Rowson's lush illustrations bring Marx's ideas to life in a number of beautifully macabre ways. 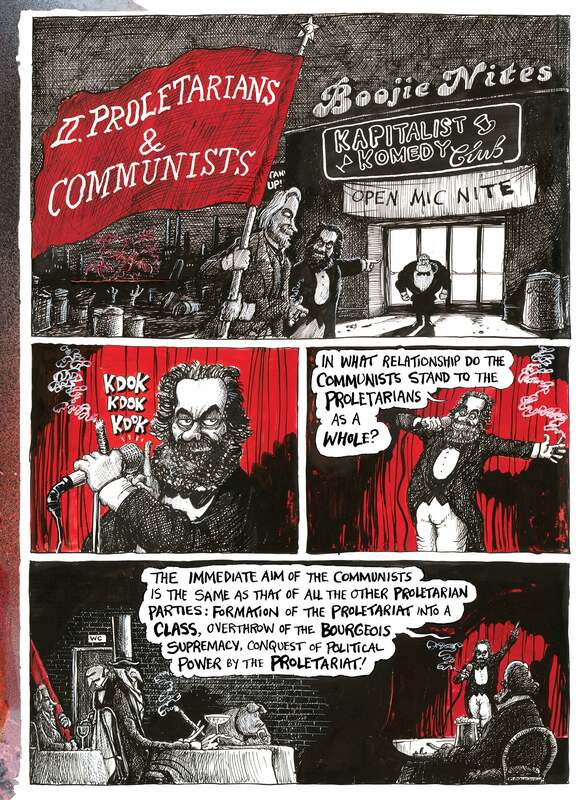 Rowson celebrates and critiques the ideas that Marx and Freidrich Engels put to paper at the behest of the Communist League - while honing in on the parts of the Manifesto that waver when held up for closer inspection. Rather than allowing his personal thoughts about the evils of capitalism commingle with Marx's prose in text form, Rowson lets the political philosopher's ideas stand on their own - giving them horrifying physical forms in his adaptation, published by Self Made Hero. The capitalism borne from Rowson's imagination is very much a cold, hard leviathan of a machine that's powered by the endless labour of the proletariat who are ultimately consumed and destroyed by the system. But at the same time, Rowson envisions capitalism as something more mutable and dynamic than just an intricate system of cogs. At times capitalism is a literal instrument of violence that the bourgeois use to torture the working classes. But Rowson also unpacks the ways in which capitalism can breed a system of beliefs that reinforce the idea that it is the only way that a society can successfully function. 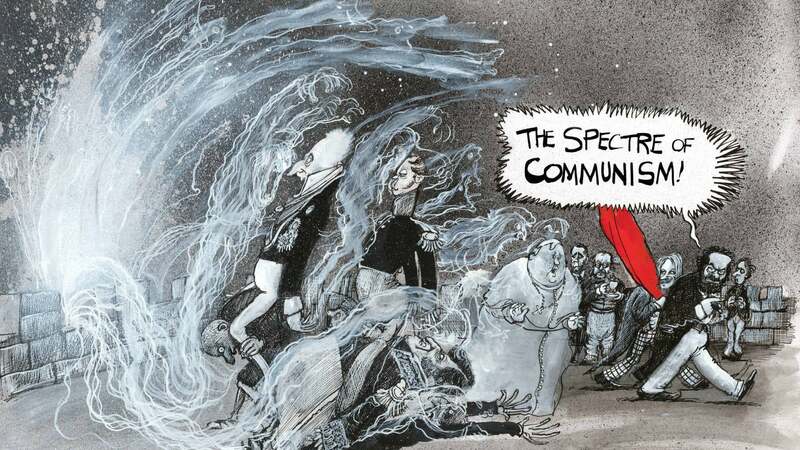 Rowson's interpretation of the specter of communism, for example, isn't simply a widespread fear of an alternative ideology, but rather a literal ghost conjured from the depths of hell by those in power, in order to maintain their dominance through fear and dissuasion of questioning. But in summoning an unholy power to achieve their goals, both Marx and Rowson make the argument that staunch proponents of pure capitalism have inadvertently laid the groundwork for their destruction. In bearing the ever-growing burden of meeting the demands of the marketplace, the proletariat - a grotesque mass of inky, mutilated bodies that are chewed up and spit out across the landscapes of each page - are disproportionately harmed. The experience leaves millions of them maimed and murdered in a variety of horrific ways, but those who survive and endure come to see the necessity of dismantling the system if they ever want any hope of living as free people. But Rowson very carefully makes it obvious that he's poking fun at the spark of optimism that's woven into Marx's ideas, because the kind of revolution that The Communist Manifesto agitates for can't be achieved just through an uprising alone. Rowson portrays Marx himself as a cocksure, smug commentator who bobs and weaves his way through the desolate world and its colossal, Lovecraftian monstrosities (one of the many forms capitalism takes). But here, Marx isn't just an impassioned crusader for revolution - he's something of a crazed zealot who presents his philosophies at an open mic night to a distrustful, disinterested audience. Rowson illustrates the double consciousness that comes part and parcel with believing in the concept of communism when a person is still an active and invested participant in capitalist society. The proletariat may recognise communism as an ideal alternative to its current situation, but it baulks at the sort of class conflict Marx posits is necessary for radical change. We all enjoy a number of luxuries that our forebearers could scarcely imagine, but many of them come at a substantial social and moral cost that we would all do well recognise more often. Our willingness to participate in the deeply flawed system is one of the main causes of the continued subjugation of the working class, something that Rowson likens to farm animals lining up for slaughter. Regardless of your political leanings, everyone owes it to themselves to read The Communist Manifesto at least once - if only to be able to draw their own conclusions about it. The Manifesto's always been a rather easy read and Rowson's adaptation makes it even more accessible, but the graphic novel also serves as an all-too-timely reminder of just what kind of world we're living in today.